Your end users will have the flexibility on browsers: Internet Explorer version 6 and above, Edge, Firefox, and Chrome. The support for other platforms (macOS, Linux, and mobile) will be available soon. 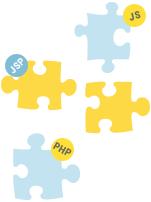 Server-side programming language support: ASP.NET (C#/VB.NET), PHP, JSP, ASP, etc. There is no dependency on any third-party frameworks. So any web server is supported, such as Nginx, IIS, Tomcat, Apache and more. Barcode recognition DLL is where the barcode detection and decoding actually happens.